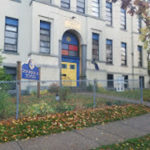 The purpose of this project is to uplift the multi-disciplinary Dojo in the Shambhala School. The Dojo is an open classroom space on the second floor, with hardwood floors and big windows. 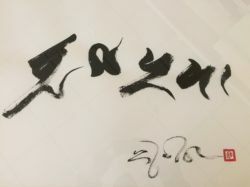 In 2004 Sakyong Mipham Rinpoche did the calligraphy “Noble Child” for the Dojo. The Dojo is used by students in the school for meditation, talking circles, contemplative disciplines and arts, martial arts, and yoga. It is also used occasionally for evening or weekend meditation and feast practice. The Dojo has a small collection of gomdens and zabutons, some of which are handmade and of poor quality. In order to live up to its potential as a magnetizing and useful practice space, the Dojo needs an uplift. Expanding the collection of good quality cushions, installing lighting to improve on the current fluorescents, and installing shoji screens over the long chalkboard wall, would transform the space. A Shambhala GES banner would create an aesthetic and meaningful “center” to the space. A fresh coat of paint and new curtains for the windows would complete the project.